The double-shelled grass carp reovirus (GCRV) is capable of endogenous RNA transcription and processing. Genome sequence analysis has revealed that the protein VP2, encoded by gene segment 2 (S2), is the putative RNA-dependent RNA polymerase (RdRp). In previous work, we have ex-pressed the functional region of VP2 that is associated with RNA polymerase activity (denoted as rVP2390–900) in E. coli and have prepared a polyclonal antibody against VP2. To characterize the GCRV RNA polymerase, a recombinant full-length VP2 (rVP2) was first constructed and expressed in a baculovirus system, as a fusion protein with an attached His-tag. Immunofluorescence (IF) assays, together with immunoblot (IB) analyses from both expressed cell extracts and purified Histagged rVP2, showed that rVP2 was successfully expressed in Sf9 cells. Further characterization of the replicase activity showed that purified rVP2 and GCRV particles exhibited poly(C)-dependent poly(G) polymerase activity. The RNA enzymatic activity required the divalent cation Mg2+, and was optimal at 28 °C. 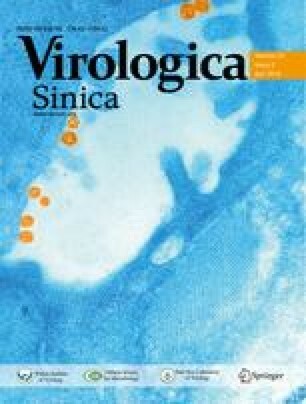 The results provide a foundation for further studies on the RNA polymerases of aquareoviruses during viral transcription and replication.